It’s a fall Monday morning in New Haven, Conn., and Officer Christian Bruckhart has lost track of how many calls he has had. He thinks it has been six. Maybe seven. There was the family dispute involving vandalism to a car. He needs to write reports on stolen property and a woman being harassed on Facebook. But first, he has to help search for a missing woman who may be suicidal. “I’m backed up,” he says. There are supposed to be six officers patrolling this territory; three are on duty today, including one who’s already into overtime. The New Haven Police Department simply doesn’t have enough cops. It’s a nationwide problem, as agencies that slowed or froze hiring during the recession are now struggling to build their ranks up again in the middle of a hot job market. Officers are retiring faster than they can be replaced. New Haven is worse off than others. At last count, the department was 100 officers short. Part of the problem is money — evident in the department’s worn-out squad cars, one of which has a rust hole in the floorboard that has been patched with an old license plate. Suburban police departments can offer better pay and are luring away New Haven’s midlevel officers. The result is a department that’s both short-staffed and green. The severity of the officer shortage varies from department to department, but the national trend is clear: Since 2013, the total number of working sworn officers has fallen by about 23,000. The number of officers per capita is down even more sharply, from 2.42 per 1,000 residents in 1997 to 2.17 officers per 1,000 in 2016. Recruiters blame the hot job market, as well as greater skepticism about law enforcement as a career choice. That skepticism has grown in the past few years, fed by viral videos of controversial incidents of use of force by police. Where hundreds of people used to apply for a job opening, now it’s often only a handful. “It’s become more like recruiting for a football team,” says Undersheriff Jeff Mori, of Oregon’s Washington County. His agency is short about 55 people and relies heavily on mandatory overtime to cover all the necessary shifts. He says seeking out enough new recruits is a full-time preoccupation, and it has pushed the agency to change some of its requirements. “We now allow facial hair,” Mori says. “We allow tattoos; we allow earrings.” The sheriff’s office will even hire people who admit to past use of marijuana, since the drug is now legal in Oregon; though they’re not allowed to use it once they’ve been hired, because it’s still illegal under federal law. Mori says potential recruits today have different expectations. “I don’t know if they want to be cops as much as the previous generation,” he says, adding that those who are interested are looking for a kinder, gentler version of the job. Deputy Chief Valerie Cunningham, who runs training and recruiting for the Indianapolis Metropolitan Police, has noticed the same trend. She thinks the recruiting crunch is pushing departments to cater more to young Americans’ preference for community policing, which she sees as the direction departments should be going in. Still, that’s a long-term process. Cunningham’s more immediate concern is rebuilding the ranks of the Indianapolis Metropolitan Police Department, which is also short-handed. The fact that this shortage is being felt nationwide means she has to worry about other departments hiring away her officers. ” ‘Poaching’ is, yeah, the less-polite term, but it’s exactly what it is,” says Cunningham. Earlier this fall, the Seattle Police Department put up a billboard in Indianapolis, advertising its interest in hiring away local cops. “I’ve been in this career for 27 years. I’ve never seen a billboard pop up from another agency in our own backyard,” Cunningham says. Seattle, which is trying to emerge from a federal consent decree to reform its use of force practices, is both short-staffed and eager to increase the racial diversity in its ranks. The department’s “lateral officer” recruiting video features an African-American officer expressing satisfaction with good compensation and less rain than you would expect. 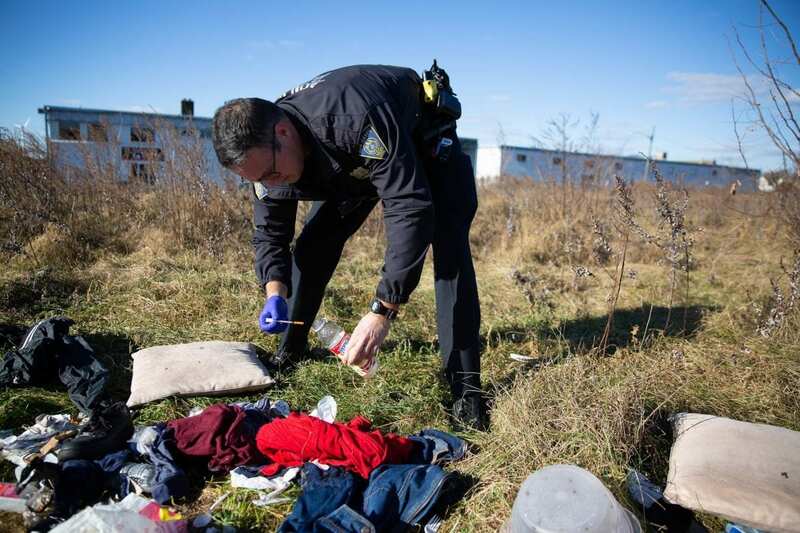 But lateral hires do nothing to solve the national shortage of officers, and many departments are starting to find ways to live with the new reality of a smaller police force. In Washington County, Undersheriff Mori says one solution may be more technology. The Washington County Sheriff’s Office has also experimented with a portable facial recognition system, to speed up identification of potential suspects in the field. Lori Mack is a reporter for Connecticut Public Radio.